Employees in various work settings and professions face different issues that have ethical implications, such as self-interest and honesty, workplace bullying and incivility, corporate social responsibility and citizenship, and whistleblowing. Individuals’ reactions to these issues are affected by their personal characteristics, key issue-contingent factors, and their work environments. Leaders should therefore develop workplaces that enhance the experiences of employees. In particular, positive human resource policies, organizational ethical practices, and transformative leadership styles can enhance individual work attitudes, as well as motivate employees to think and behave more ethically. The degree to which organizations institutionalize ethical values and satisfy important social responsibilities can also positively impact employee wellbeing, and this support can enhance how individuals perceive their jobs and the organization as a whole. This presentation highlights many of these issues and outlines some associated research. 4 to 4:30 p.m. – Reception. All are invited to gather for fellowship, conversation, and refreshments. The Lectures are occasions for members of the University community and public to engage and strengthen their sense of unity. It is also an opportunity to share the important work of the University with our broader community. 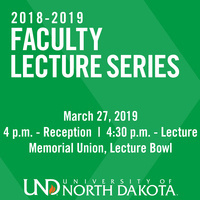 Funding for the UND Faculty Lecture Series is provided by the Offices of the President and the Vice President for Academic Affairs. This lecture is free and open to the public. Free parking is available south of Columbia Hall, across University Ave from the Memorial Union.